If the bookies included our fixtures on their betting lists I think our opening sequence of results in the Nines league would give a good clue as to the next result: LWLWL… This week’s defeat at Fossway was pretty disappointing, and the first defeat where we could reasonably say we probably should have won it. Fossway have struggled a bit at the start of the season, but in fairness they put out teams in two separate leagues on a Tuesday night, so it was just as well they weren’t picking a team from the full complement. The triples, skipped by Brian Elstob in his Nines début (or at least the first game for several years) established a good lead but then wobbled before re-asserting themselves to take a seven-shot lead into the last. Not even the extreme firing of the Fossway skip could pull that back – the only question was whether his bowls or the back board would be the first to splinter. A four-point win on that rink, then, earning the only points of the night as both the Fours and Pairs lost by three shots. The Fours got off to a bad start – nothing disastrous, but consistent singles lost so that they were 0-7 down after six ends. David Ashworth kept encouraging the team, though, and very soon they pulled things back, to edge ahead 9-8. It remained tight at 10-10 and 13-13, but then the home side went ahead to lead 18-13 going into the last end, and the five was too big an ask. Meanwhile the Pairs ended up in an exact reversal of last week’s match, two down going into the last but then finding the opposition lying shot and needing a wonder shot to dislodge it. Just like the Walker skip last week, Trevor tried a bit too hard with his attempt and the result was a three-shot (16-19) defeat. But these results all show how competitive the league is – even if the game was watched by (literally) one man and his dog for most of the time. The clouds had been building up through the match and by next morning it was raining steadily – certainly enough to cause a postponement of the ladies’ match at Chirton. At the time of writing they are third in the division, having already played both of the teams above them, so that looks promising. In the Nines league the league tables, compiled centrally, are lagging a bit, but what we can say is that after five matches we have exactly the same number of points as we did after the first five last year. The bookies would give pretty long odds on our repeating that success all season long, but at least there’s still everything to play for. A pity we can’t quite say the same about the West Tyne league, but when the games are as good as this week’s no one is going to mind. Last year it was the 2012 champions, Haltwhistle, who got off to a bad start to the season, and this year we are repeating the trick. Unbeaten until the last game last year, we have lost both this time, but at least this week’s loss to Hexham House was really close – indeed, about as close as you could get without a tie. We lost two rinks (one of them 17-18 after a measure on the last end), drew one and won one – and the shots (most unusually) were tied, at 68 apiece. It was calculator stuff, but the end result was a 4-3 points win for Hexham House. The Nines on Tuesday was another close match. When we played Walker in this fixture last year we won 8-0, but we’d all agreed it could easily have been 8-0 to them if just a few bowls had fallen differently. It was close again this year. At half-way (nine ends) the shots score was 22-21 to us, with the three rinks showing 8-6, 7-6 and 7-9. After that the fours fell away, losing 10-24, but both the triples and pairs had a good spell after the half-way mark. The triples built up a five-shot lead which was never really threatened as they won 13-10, but Peter and Trevor had a scare after leading by six with four ends to play and seeing the lead whittled away to one. In the gathering gloom the Walker skip could have clinched the match with his last bowl, but fortunately for us he missed his target and the 14-12 result meant we had a vital 6-2 points win. It was Trevor’s second close win of the day. In the morning he and Jean Allen played a County mixed pairs match at Burradon. The Elvaston pair played well enough, winning six of the first eleven ends. Unfortunately, the home team’s five ends included every score from one to five, so that they led 15-9. Worse was to follow, as the lead stretched to 18-9 after thirteen. However, in a 21-end match the “run-rate” was still manageable, especially as we got some momentum from winning the next five ends to take the lead. The last few ends were very tight, and there was a chance for the opposition to draw or even win the game with the very last bowl, but here too there was just too much to do and Jean and Trevor won 24-20. The next match is also away, at Amble (2 June). The Ladies clearly hadn’t read the script (or my draft for this piece), as they had anything but a close result in the Collins & Shipley league, beating Seaton Delaval 10-2 on points. Two rinks had large wins of over ten shots, but the third rink fell away and lost their lead in the last few ends to lose by four. There were a lot of short bowls on this rink, but even when Thelma drew what looked like the perfect shot to draw level near the end the opposing skip was still able to take it out to confirm a win. Despite the heavy rain on Wednesday night, and standing water on the green by Thursday morning, it had dried out enough to allow the Edwardson Cup game against Cramlington to go ahead. Last week we enjoyed a narrow win in Round 1, but tonight we were on the receiving end. After a slow start we were 14 shots down at half-way (nine ends), but a good recovery saw one rink draw, one win by five shots and one lose by nine: a 47-51 defeat was all the more galling in that Trevor’s rink (21-16) lost only one of the last nine ends – but it was a seven! What was that about ifs and maybe’s? This entry was posted in Bowls and tagged Edwardson Cup, mixed pairs, Walker on May 23, 2014 by Fields. With various call-offs because of injury, illness or (shame!) holidays, we really struggled to make up the numbers for the Edwardson Cup match on Thursday. It was against Health and Security, rather aptly based at the Blue Flames sports ground, and we were certainly cooking on gas early on, with two of the three rinks 5-0 up after three ends. At this point there was what you might call a power cut and by the half-way point (9 ends) we were eight shots down overall, in a match decided on aggregate shots. After 13 ends there was still an eight-shot difference (35-27 to the hosts) and after 16 ends the margin was still six. However, on the seventeenth end David Ashworth’s rink picked up a four and Bob Turner played the shot of the night, trailing the jack to turn a deficit into three shots: suddenly we were level with one end to play. We had the momentum now, and all three rinks won their final end, to finish with a 50-43 win. In fact, because the rinks played at different speeds, the neatness of the cards wasn’t reflected on the green, where Bob’s rink was left to see out the final end knowing that anything better than losing a five would do. They duly wrapped it up, but after such a late turn-round it was still exciting. For a long time it looked as if we might have to pack in early, but after about the twelfth end the rain stopped, as did the rumbles of thunder and the teen scene. By this stage the pairs and triples were beyond all hope, the pairs in particular undone by some wonderfully accurate bowling by the home team in difficult conditions. The fours, who had been only 4-5 down after nine ends, remained in contention but seemed then to have blown it by going 9-12 down with only two ends to go. Would their single shot on the next end be enough? You bet – they may not have nailed the jack in the last end, but the home team seemed to crumble with the pressure and David’s rink picked up a four to go ahead for the first, last and only time in the match. Always a good time to take the lead. The ladies had a good result too in the Collins and Shipley, with one winning rink, one drawn and one lost in the game against Seaton Sluice. Crucially, in a format where the side with the higher aggregate shots get six bonus points, we won the shots count and therefore got a 9-3 points win that went some way to restoring confidence after last week’s opening defeat. The only downside to our involvement with teams in and around Newcastle is the amount of travelling. After the men’s two evening matches, 40 and 30 miles away, we had a mixed friendly today at Gosforth – only 25 miles this time. It was a lovely afternoon, with good company, a well-used green running several yards faster than our own (about ten yards faster than Blue Flames!) and a brilliant tea. Because no one likes to mention scores let’s just say we ended up with two big rink wins and a small one against Gosforth’s one big win and two small ones. Ok, and it was a margin of twenty! At least this was no last-gasp affair – though we were all gasping for a cup of tea by the time it finished. 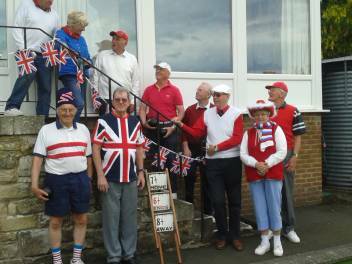 This entry was posted in Bowls and tagged Ashington, Edwardson Cup, Gosforth on May 17, 2014 by Fields. 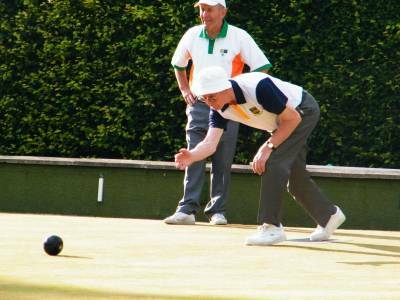 The week’s competitive bowls began at Wallsend Park, with a Nines League match. It turned out to be pretty close, one of those games which could have gone either way, so we were very happy to come away with a 2-1 win on rinks. The triples lost 14-18, sharing the ends won, which after being 1-9 down after five ends was pretty good. The pairs were in all honesty flattered by a 20-12 scoreline, having been leading by only three shots with three ends to go in a game that was close all the way. Meanwhile, although the fours were on top all through their match, winning twelve of the 18 ends, this was also a close affair, as shown by the fact that 14 ends in the match ended in a single-shot margin; none the less, a 14-9 win was very acceptable. The most dramatic part of the evening was still to come, though. We were warned by the home team that the park closed at 9 pm – a bit tight, given that the match started at 7. Never mind, we were all off the green at nine exactly. 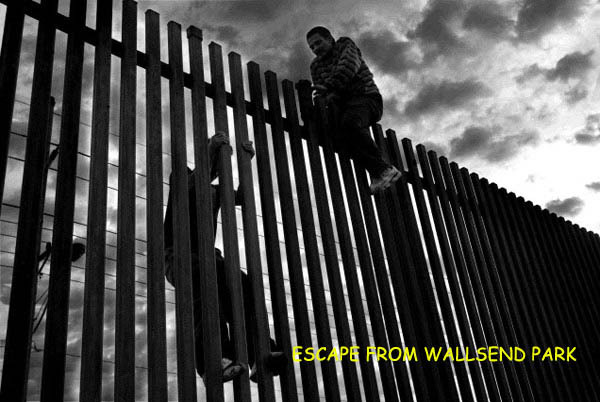 A Council jobsworth had other ideas, however, and had to be detained in spurious conversation while the last of us rushed out as he brandished keys to lock the gate. Unfortunately the message had not got round to everyone, and three of our group were trapped, having headed for the wrong gate in the labyrinthine paths. It was only later, after the rest of us got home, that we learned they had wandered around for over half an hour before (happily) coming across what we would once have called a courting couple, who (naturally) knew where the lowest railings were! It still required climbing over metal spikes, and meant a very late arrival back in Hexham. That opening probably suggests the way things went in the first match. Despite home advantage we were rolled over by a Haltwhistle side which has lost several stalwarts this year but also managed to pick up some new recruits who are very handy bowlers indeed. They were far too good for us tonight anyway. Although one of our rinks won 21-11 the others all went down. One of these was 6-26, with only five ends won, but however bad that sounds it got even worse for my own rink: after winning the first two ends to go 2-0 ahead we might as well have gone home at that point, as Haltwhistle won the next 14 ends to produce a scoreboard reading 2-30. Even picking up four shots on the last two ends could hardly save the embarrassment. It was like one of those days when you get so wet in the rain that you stop worrying and even start to laugh about it. But at least no one got locked in! This entry was posted in Bowls and tagged defeats, Haltwhistle, Wallsend on May 8, 2014 by Fields. This blog is made up of match reports for Hexham (Elvaston) Bowling Club. Our main web page is at www.elvastonbowls.co.uk. On the main site we have all details of the club, fixtures, membership, etc. For the second year running we opened our Nines League season with a home game against Gosforth. At least this year they came as the previous season’s runners-up, rather than as league champions! Last year we were in our first year back in Division 1, and intent merely on staying up. In the event, a close defeat by Gosforth signalled a season which got better all the way, and finished with third place. However, losing our three youngest players has had quite an impact on team selection this year, and so we had other reasons to be apprehensive this time round. The Fours were up against a very strong rink, and were soon 1-10 down. A good spell then saw them recover to only 7-12 down, but the opening blitz was matched by a strong finish for Gosforth and the rink lost 8-23. The Triples also put up a good fight: leading 7-5 after eight ends, they were only one shot down at the half-way point in the game – at which point Gosforth changed tactics (jack length) and never looked back. winning seven of the last nine ends for a comfortable win. The Pairs seemed to be having some bad luck with wicks or near misses, and were 7-12 down after twelve ends. But a couple of good ends put doubt in the opposition’s minds, and it was soon 12-12. Taking a two-shot lead into the last end Elvaston not only protected it but added a single, for a 16-13 win. So it was two points on the night, just like last year, albeit with not such a good shots difference. But with a victory unlikely two points was as good as it was likely to be. If you can’t be optimistic at this time of year, you never will be! Two days later we were back at Hexham House for a friendly. There were six full rinks, and six full tables of a lovely tea afterwards, with a really good atmosphere all round. A win by about 20 shots overall was some small consolation for the Cup defeat although – of course – the result truly doesn’t matter in these encounters. This entry was posted in Bowls and tagged Gosforth, Hexham House on May 4, 2014 by Fields.